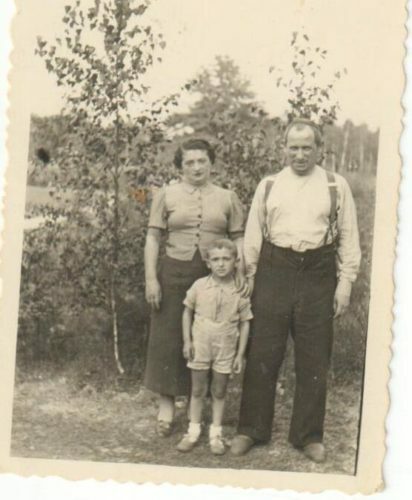 Pre war, my uncle Wolf, with my grandmother and grandfather, before the Nazis separated he and my dad first from their parents. In time, Mengele separated him from my father too. As I read of children and babies held hostage in cages–as little more than bargaining chips–my dad’s singularly monstrous experiences of separation and loss during the Holocaust have come back to haunt me. Whether you agree that the Holocaust comparisons to the current day madness are fair or not (I admit that I find the comparisons troublesome sometimes), I think when you read this, you might at least agree there are powerful lessons to be learned and that our despair over the abuse and indignities being inflicted on migrant families and especially to the children at our border is entirely warranted. When any category of people are treated so callously, and our President lies so brazenly about ‘who created the situation,’ as the situation persists, yes, you damn well better question authority to the max, and do not stop. To protect helpless children, I do beg you: please lose any moral qualms about assuming the worst. We know full well that the worst is possible. It is all our jobs now to guard against the worst. The worst, the Holocaust taught us, also comes incrementally. After being separated from the rest of his family (all of whom–except for my dad and grandfather–were killed at Auschwitz), my father and Wolf (who was two years younger) had managed to stay alive during the Holocaust after being dragged away for ‘work details,’ i.e., slave labor. Together, they suffered and together they survived a series of smaller ‘labor’, i.e., concentration, camps. Through it all, what meant absolutely the most, what time and again would trigger their survival instinct and help the other through, was that they had each other. They looked out for each other, my dad told me. Being together meant everything. But then they were sent to Auschwitz, too. An excerpt (lightly edited) from my Poppy’s memoir. “The Germans decided to send us to the concentration camp Auschwitz. Arriving there we were greeted by the S.S with the infamous Dr. Mengele. They lined us up and the Dr. was telling us that all injured or too young to do hard work will go to a special location for the injured and children, and will be taken care of. I had a little suspicion. He (Mengele) got in front of me, and for some reason, he asked my age. I said 16, and added that we are very good workers. My brother (Wolf) said nothing; he was younger than me but taller and a fiery red head. He (Mengele) told my brother to step forward and told him that he will be better off being with children. Our (Jewish) camp leader was a 6’ tall guy. He showed the S.S. officer his damaged finger, so he told him to also go with the children and take care of them. In the meantime my brother came running back asking for half of the bread we still had. I begged him to stay with me, but he argued I should go with him. One of the soldiers noticed the commotion and asked what was going on. I said that I have the whole bread, so he said to break the bread in half and give that to him. They went one way, and we vent to shower, change our civilian clothing into striped uniform and we all got tattoos injected into our forearms. My # was 141940 with an upside triangle underneath. I mentioned that I came here with my brother who was transferred to a camp for children. In Wolf’s memory, may the gross mistreatment, abuse, and human rights violations of children at America’s border–AMERICA’S border–STOP. We are better than this. Grace Bennett is Publisher and Editor of the Inside Press. She has been on the board and advisory board of the Holocaust and Human Rights Education Center since 2007 and is a member of Women’s March for All. Her father (‘Poppy’) Jacob Breitstein is a 96-year old Holocaust survivor. 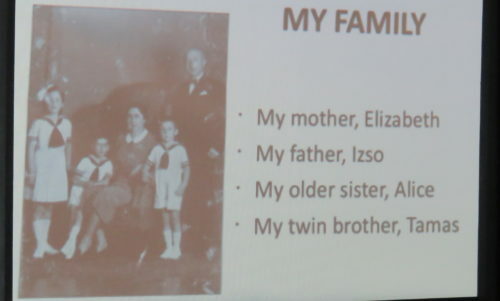 Peter Somogyi, a survivor of Auschwitz-Birkenau and victim of Nazi experiments on twins, still grieves as he bears witness to the unimaginable. 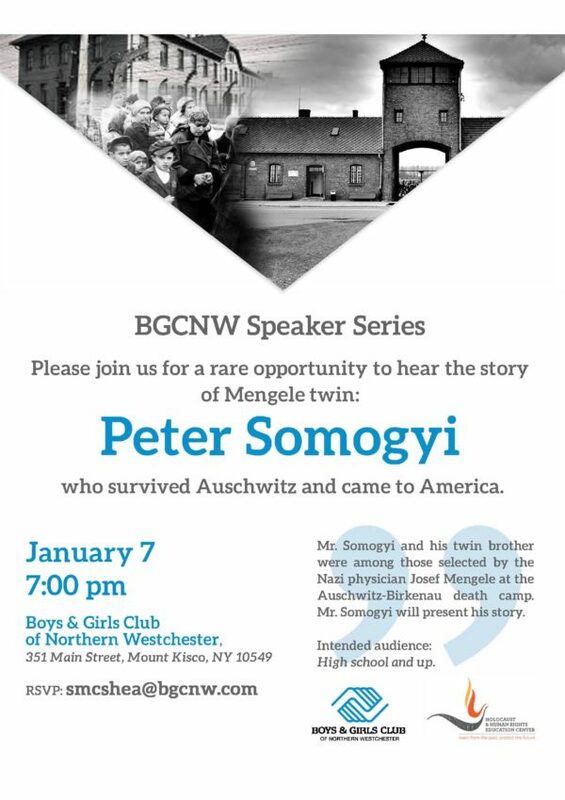 Mount Kisco–Peter Somogyi , a survivor of Auschwitz-Birkenau, was 11-years-old when he and his twin brother Tamas were ‘selected’ and imprisoned as concentration camp victims and subject to the horrific ‘human experiments’ performed by the notorious Josef Mengele (“the Angel of Death”) and others. Somogyi, now 85 years old, said he would not talk about his imprisonment or experiences for decades. 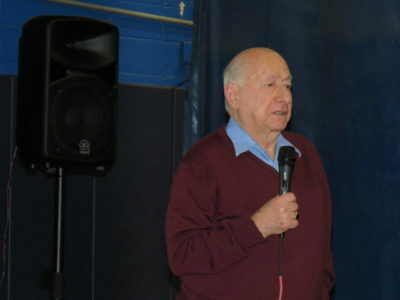 But at the Boys and Girls Club of Northern Westchester BGCNW on January 7, Somogyi, a member of the Speaker’s Bureau for the Holocaust and Human Rights Education Center for the last four years, relayed his memories to attendees. 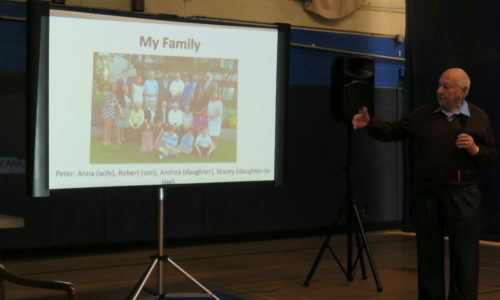 Opening the program, Alyzza Ozer, BGCNW’s executive director, said that Somogyi’s talk was the Club’s first in a Civic Advocacy speaker series within ‘Youth for Unity,’ a program launched at BGCNW, which serves 500-800 kids a day, ages 3-18 (nationwide, some 4.2 to 4.3 million). The Club’s mission, she said, is to inspire and enable all youth to be best they can be and advocate on behalf of the community. 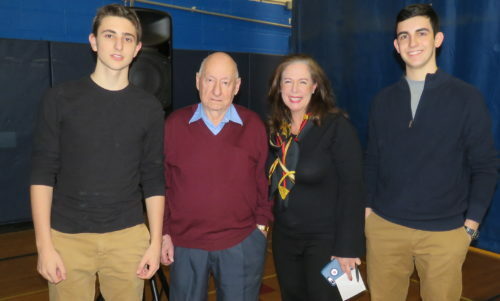 Introducing Somogyi were Aaron Notis and Jason Fine, Horace Greeley High School juniors who are volunteering with the HHREC to bring lectures about the Holocaust and genocide to wider audiences. They said they got involved due to a scourge of modern day anti-Semitism and bigotry. They noted that 900 hate incidents were reported across the U.S. in the 10 days following the 2016 election. Those attacks included vandals drawing swastikas on a synagogue, schools, cars and driveways. They pointed out the now infamous march of white supremacists in Charlottesville last October and their anti-Semitic chant. They also expressed concern over a growing, so called BDS movement that veers into anti-Semitism. 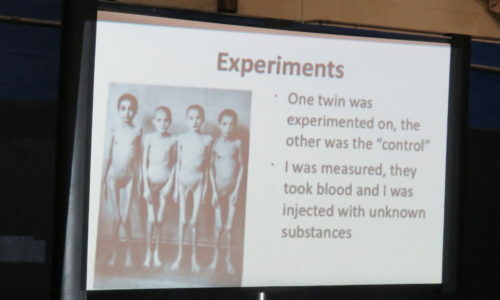 Somogyi said that the twins considered their horrible situation ironically life saving (“although I hate to call it that,” he said) in that they were of some “use” and despite that the twins and others chosen to be experimented on lived in abject fear “wondering when Mengele would decide he didn’t need us anymore.” They knew that “any moment, any time, we could go to the gas chamber like the others.’ In addition, many of those subject to the experimentation died as a consequence of them; others were murdered in order to facilitate post-mortem examination, according to a document from the United States Holocaust Memorial Museum. By January, 1945, the Nazis had already lost the war on many fronts. “On January 27, we saw our first Russian soldier,” Somogyi said. “Imagine an 11-year-old thinking, when is my time to die? And then, finally, I am free. You don’t know what kind of feeling that is.” His brother Tamas survived as well. In time, he discovered that his father Izso had survived Dachau. He described a journey back first to Budapest (he and Tamas were reunited with their father with a neighbor’s aid in Hungrary) and then to Israel (where he became an officer in the army), from where he left to England, and finally, to the United States. Bearing witness continues when the BGCNW on March 4th at 7 p.m. welcomes guest speaker Rita Kabali Wagener, a survivor under the regime of Idi Amin in Uganda. Do mark your calendar. Grace Bennett is publisher and editor in chief of the Inside Press, and the 2017 recipient of the Holocaust and Human Rights Education Center’s Bernard Rosenshein ‘Courage to Care’ award. For more information and membership info about the Boys and Girls Club of Northern Westchester, please visit bgcnw.com, and for same at the HHREC, please visit hhrecny.org. Save the date for what is sure to be an incredible speaker presentation at the Boys and Girls Club of Northern Westchester (BGCNW) on January 7 at 7 p.m. Holocaust survivor Peter Somogyi will be speaking about his experiences during the Holocaust and how he rebuilt his life thereafter. 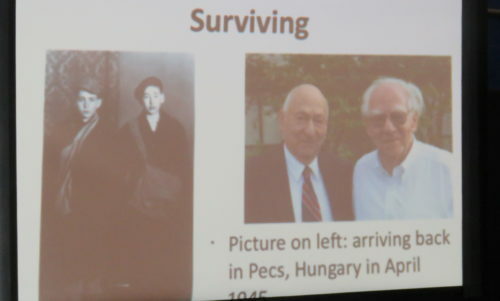 Mr. Somogyi and his twin brother were selected by Dr. Mengele and endured time at Auschwitz as children. “It is critical for people to hear these stories…now more than ever,” said Solveig McShea, director of development at BGCNW.